Interior Features Architectural Design by Visionary Designer, Bud Holden, in 1986. Grand Style and Space. Large Rooms that have form and function. Quality Finishes. This home provides comfort and prestige to the Occupant. Meticulously maintained. Quality Furnishings. Timeless! Exterior Features Large Corner Lot. Manicured Gardens. Private Flowering Patios enhance various main rooms throughout the house. Solar Heated Pool. Additional Features and Amenities Great Neighborhood Location. 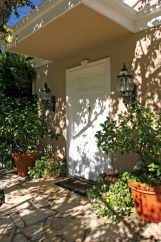 Private and yet totally accessible to Beverly Hills and the San Fernando Valley. Beautifully upgraded and maintained.